An analysis of dairy farm business records from Michigan, New York and Wisconsin confirm large herds, those with more than 500 cows, are more profitable and resilient than smaller herds. Chris Wolf, an economist with Michigan State University, compared 14,824 farm records in the form of balance sheets and income statements from 926 farms: 120 from Michigan, 224 from New York and 582 from Wisconsin. Because these farms participated in farm financial records programs, it’s clear they were well-managed farms. “These are not randomly selected, and almost by definition, they are better than average farms,” he says. Some of the farms also have other enterprises or cropping operations. By and large, though, 85% of the income from these farms come from dairy. Wolf divided the farms into three groups: Less than 200 cows, 200 to 499 cows and more than 500 cows. “There is lots of variation among the groups,” he notes. “The smaller farms that are not having as much stress have been around for a long time and have lots of equity, low debt and high components and milk quality,” Wolf says. And there are large herds that struggle because they have recently expanded, taken on a lot of debt and don’t have their production systems quite set yet. But generally, big herds do better than small herds. The first advantage is economy of scale. “The average cost of producing milk declines sharply as herds grow larger, and levels out at 1,500 cows,” Wolf says. They leverage economies of scale in capital and labor, spreading costs and labor over more cows and more pounds of milk. 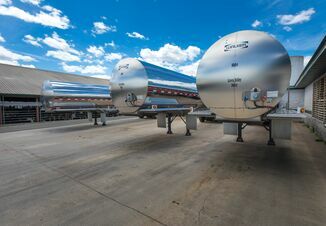 They typically have better, newer technology and equipment, which increases efficiency and lowers production costs. Large farms have relatively more equity and liquidity, which allows them to leverage both in good times and in bad. They are much more likely to be incorporated, which separates and protects personal assets. Incorporation also has tax and state transfer benefits. Large farms are better able to use market-based price risk tools, and they tend to make better use of these tools. That suggests larger farms are more consistent in production practices. 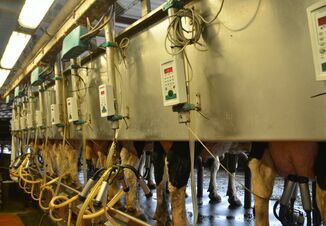 That, in turn, increases milk production and reduces the need for supplements, further reducing the cost of production. Larger farms also tend to have specialized labor and, as a result, have more consistent protocols for milking cows and caring for livestock. However, large farms are not immune to market price swings, and Wolf’s data shows they can have larger nominal losses in times of low milk prices or high input costs. But because of their size and volume they tend to bounce back faster. Smaller farms are also at a disadvantage because family living is spread over fewer cows. “Most farms are drawing $60,000 to $70,000 for family living each year,” Wolf says. In bad years, most families can cut back somewhat on living expenses. But to expect families to live on $15,000, as some do, is not realistic either, he says. Smaller farms need to optimize where they can, such as getting milk quality and component premiums. Others specialize in genetics, organic production or grazing. But farms that succeed in these specialty areas are farms that tend to be pretty good to begin with. “If farms are already struggling, they’ll likely struggle with a new venture,” he says. The key is to be fully informed on your farm’s financial situation. “Sometimes that’s not fun to see, but at least you can make informed decisions,” Wolf says. “If equity is trending downward, maybe there are things you can do to turn it around, or maybe it’s time to do something different with your time or land. There is no better time to get up to speed than now. “So often, farm advisors tell me that if clients had come to them two years sooner, they could have done something,” Wolf says. His message: Don’t wait.